We make a breakfast burrito that has eggs and beans in it, very filling and you never miss the meat. We generally do chili or pizza. I've also done veggie stews with dumplings and nachos. All big meals that fill you up. We do a lot of Indian and Mexican food. The Indian flavors are awesome! It's easy to just swap out meat for beans in Mexican food. Yummy! We love roasted beets in a balsamic vinaigrette. It totally alleviates any meat craving, probably because of all the iron and B vitamins. They're easy to make on the weekend and munch on all week long. We frequently serve the beets as a side with warmed, sprouted corn or wheat tortillas filled and rolled with homemade garbanzo-bean hummus. A side of lightly steamed snow peas or green beans, and it's a meal so simple and so delicious we can't speak until we've gobbled it down. Had to have a bit of fast food tonight, but it was macrobiotic and vegetarian!! I love easy peasy beans and rice with cheese and veggies. Always a hit with the kids too. I left a link above to one of my heartier meat-free dishes -- Paella. So easy, so delicious! 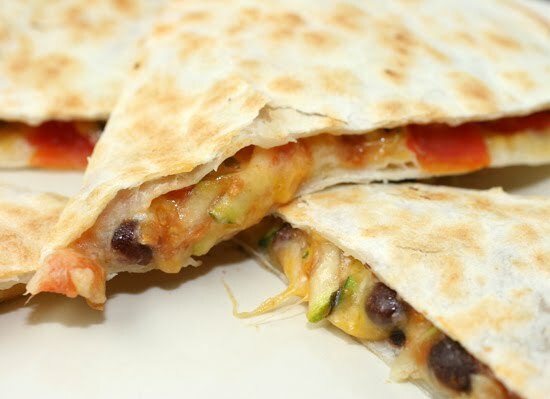 I tried the quesadillas last night. I made mine with eggplant and it turned out pretty well. Thanks for the link to the recipe. 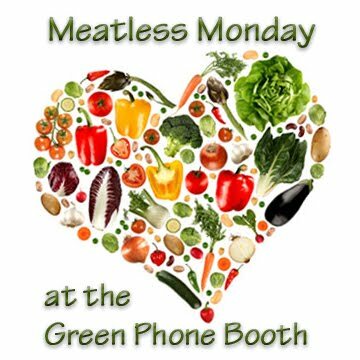 I eat a lot of meatless dishes, but this is the first time one lined up with Monday. Excellent and healthy idea. Thanks for the recipe.